The key to any weight loss plan, including the ketogenic eating plan, is being able to digest food properly so that the nutrients required are absorbed into the gut, and the rest is efficiently disposed of. Digestion thus plays a key role – the longer food is allowed to ferment, the greater the chance of toxins forming and sugars being stored as fat, rather than being utilized. Today we review Real-Zymes, a supplement by Pure Essence. Pure Essence says it has patented the world’s first personalized digestive enzyme supplement, in that the supplements are designed to help break down the foods you specifically eat. Other supplements, they argue, adopt a one-size-fits-all approach, which is too broad to benefit you on an individual level. By contrast, this proprietary formula purportedly gives you the quickest, most effective digestion process and works best if you’re following the keto diet. Together, these enzymes break down proteins, carbohydrates and fats. Bromelain is a pineapple stem enzyme which has fast-acting, natural and potent digestive abilities. It is often used in products used to soften stool or counter constipation. Lactase is the enzyme that breaks down whole milk and other dairy products, while amylase breaks down carbohydrates such as starches in particular. The enzyme that breaks down proteins is protease. Many forms of each along with supportive bacteria and amino acids required to form and facilitate these enzymes are also present in the ingredients. Real-Zymes comes in capsule form. The recommended dose is 1 capsule per day. It is best to have this capsule 15 minutes before a meal. We didn’t find any specifically listed by the manufacturer. However, we recommend that you should consult your doctor if you are pregnant, breastfeeding or trying to conceive given the nutritional impact of the tablets, and how they will affect your digestion and metabolism. Also note that at first, according to our research on enzymes, you may experience digestive upset. This could happen because digestion is being fast-tracked in your gut, thanks to the digestive helpers. You should not experience severe symptoms or anything that lasts for many days but if you do, you should consult a doctor and/or stop taking this supplement. You can purchase 1 bottle of 30 tablets on the product website for $14.99. There is no discount for buying more than one bottle. However a 90 tablets will cost you $34.99 on Amazon, which is about a 30% discount for this higher-count bottle. A 100% moneyback guarantee applies. Should you not be happy with the product, you may return it within 60 days. It appears that the return only applies if you’ve bought this supplement on their website, not through a third-party reseller such as Amazon. Unlike other keto-based fat burn products, Real-Zymes Keto is designed with fast-tracked, efficient digestion in mind. It is reasonably priced, although there are other enzyme formulations that are less expensive. These other formulations may not be branded as keto-friendly, but would in essence effect the same purpose. The product can go a long way to aiding digestion and as such can indirectly help with losing weight, but we do not see any particular fat burn ingredients or actual ketones in this formula. We feel that the manufacturer should explain the function of each ingredient better. We also do not agree that the proprietary enzyme algorithm can ‘read’ what you are eating and react accordingly to break it down so that it is specific to each person, if that is indeed what the manufacturer is saying. No evidence by way of clinical studies or anything else is provided to support this claim either. The product is either new or is not that popular as consumer reviews are scarce, so it is hard to independently verify how it works in practise. 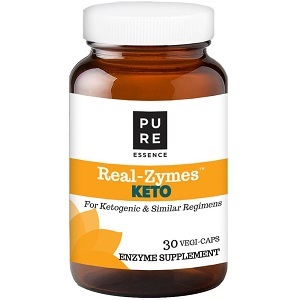 John Parker	reviewed Pure Essence Labs Real-Zymes Keto Digestive Enzymes	on March 12th	 and gave it a rating of 3.